Philadelphia is a fun, vibrant city and is full of history. From the cobblestone streets of the Old City to the gates of Chinatown, Philadelphia has new adventures around every corner. This city hosts millions of visitors each year and offers a lot of fun, family-friendly activities for all ages. Despite the central location of most of the attractions, one thing is for sure, the less time you can spend driving downtown, the better. Why take a Big Bus Tour? Did you ever see the television show Parking Wars? The show is a pretty accurate representation of getting around the City of Brotherly Love. In Philadelphia, parking is expensive, laws are unforgivable, and traffic can be a nightmare. Park in the wrong spot and they will tow your vehicle in minutes. Why stress yourself out on vacation? Enjoy the best this beautiful city has to offer by hopping on (and off) the Big Bus. Big Bus Tours take you throughout the city making stops at all of the major attractions. Your Big Bus pass allows you to hop on and off the bus at your leisure so you can enjoy as much time as you like at your favourite places – it is THAT flexible. It’s great for families both young and old especially if anyone has mobility issues or tires easily because you can discover all that Philly has to offer in a short period of time and get a great informative tour, learn about the history of the city, all while sitting down. Look out for the big red double-decker buses! 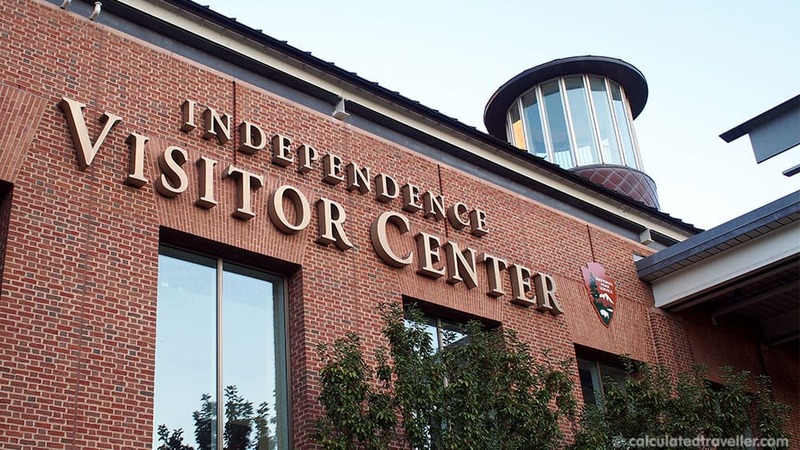 One of your first stops in Philadelphia should be to the Independence Visitor Center. Here you can grab information about the city and attractions as there are multiple booths located at the rear of the centre. 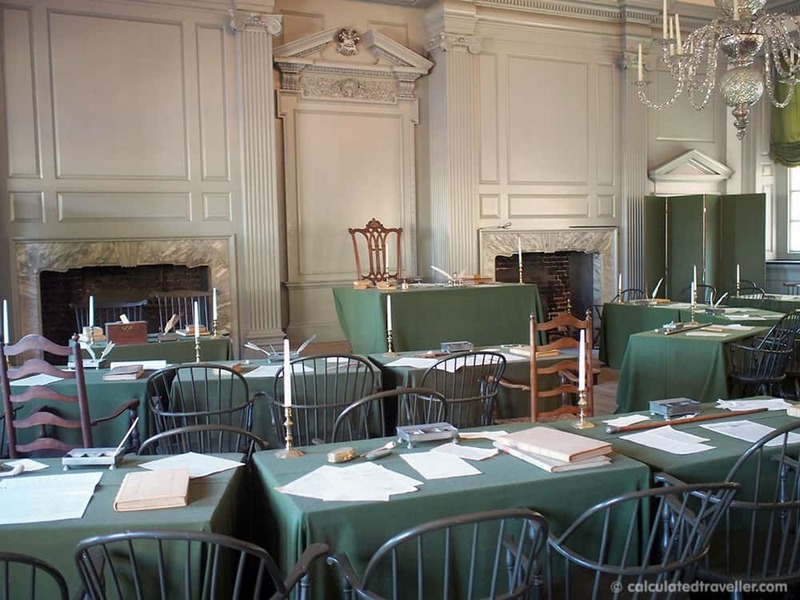 You can also visit with the National Park Rangers about the various National Park Service attractions in the city and where to pick up your tickets to tour Independence Hall. They often have Park Ranger-led tours that you can join for free. TIP: Tickets are required to get into Independence Hall. They are limited, first come first served, and have pre-set timestamps. The queue starts bright and early in the morning. We started lining up well before the Visitor Center was set to open and the queue was already down the street. 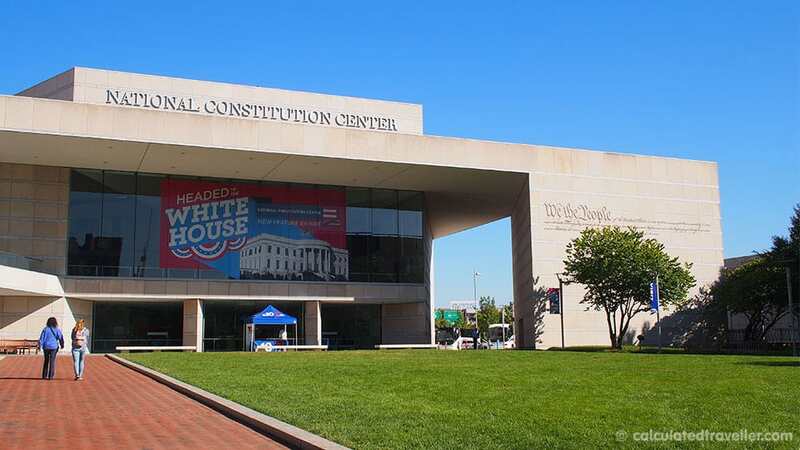 The National Constitution Center stop on the Big Bus Tour will transport you back in time to the 1700’s. While you are there, sign your name to a virtual constitution. Kids and adults alike will love the interactive exhibits and presentations that come with admission. Learn more about US history while you visit one of the United States’ oldest cities. This historic public market has been around since the late 1800’s and serves up first-class Philadelphia fare. Get all of the city’s best food in one place by making a pit-stop here. If you are visiting Philadelphia around the holidays, take a short walk from Reading Terminal Market to the Macy’s department store to enjoy their beautiful holiday window displays. TIP: The roast pork sandwich at Dinic’s is tasty, moist and filling! Reading Terminal Market is busy, so be prepared to wait in line. 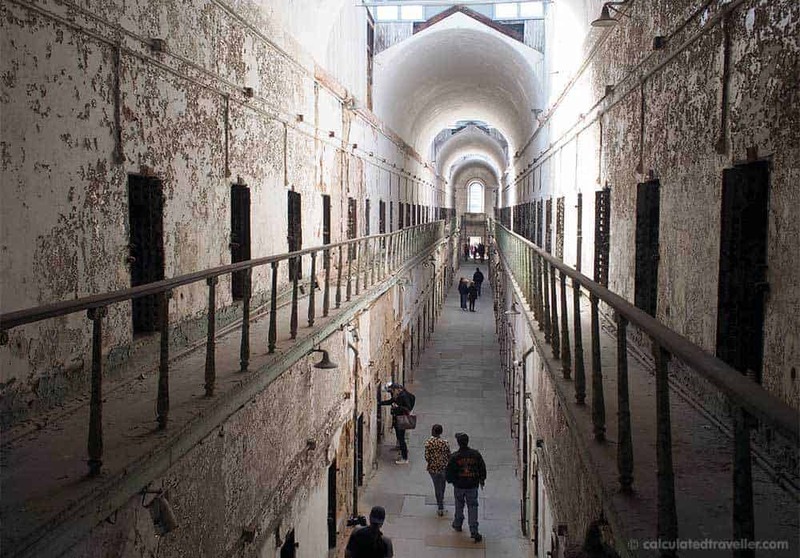 This former prison was once one of the largest in the country and housed notorious criminals like Al Capone. The daytime tour will take you through the halls of the prison and experience what it was like to be a guard or prisoner a century ago. If you are visiting in the Fall and like a good scare, grab a ticket to Terror Behind the Walls when the prison turns into a haunted attraction. The building and grounds are rumoured to be one of the most haunted places in America. 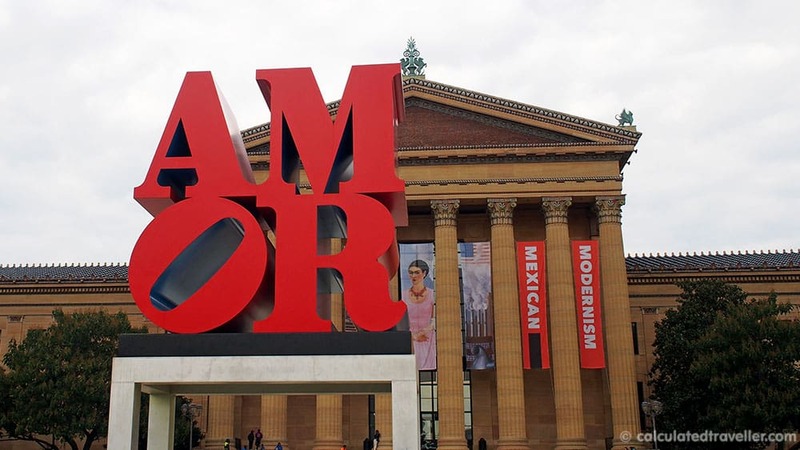 The Philadelphia Art Museum is a must-visit for your trip. Some of the most celebrated artists in the world have graced the walls of this world-class museum. It is also home to the famous steps of the Rocky franchise. Each year, millions of visitors take their turn running up the steps to the Rocky theme song, stopping at the top standing triumphantly with their arms in the air for their picture with the Rocky statue. 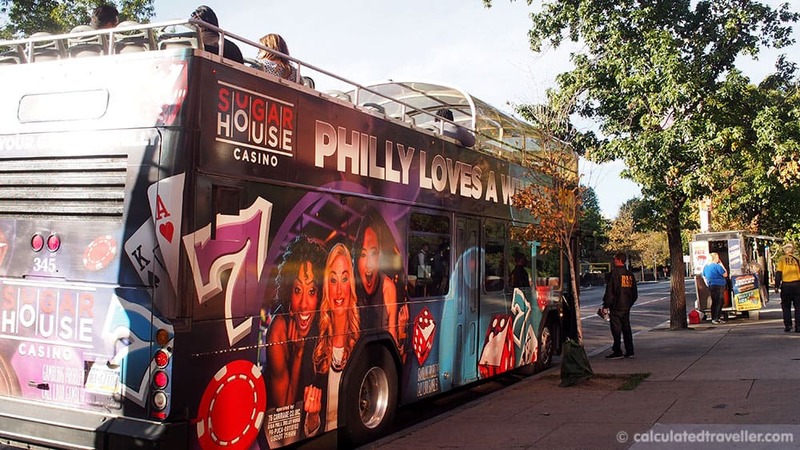 This Big Bus hop on hop off stop will check two items off your Philly bucket list. Philly from the Top is one of the newest attractions to the City of Brotherly Love. The panoramic views from one of the most massive buildings in the Philadelphia skyline will take your breath away. If you time your visit to One Liberty just right, you can enjoy the sunset over Philadelphia and then watch as the city glows at night. The Philadelphia City Hall is one of the focal points of the city. This building, which is over a hundred years old, was once the tallest building in the world. Take the walking tour of City Hall or get tickets to get a bird’s eye view of the city from the Observation Deck while you are there. 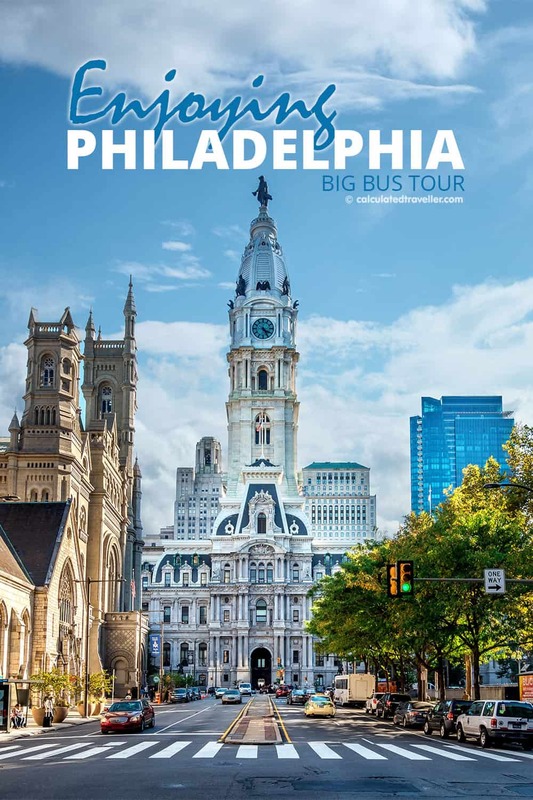 If you check out the Philadelphia Big Bus Map you’ll see that the tour includes all the major landmarks and tourist sites, such as the Betsy Ross House, Memorial Hall, and museums. 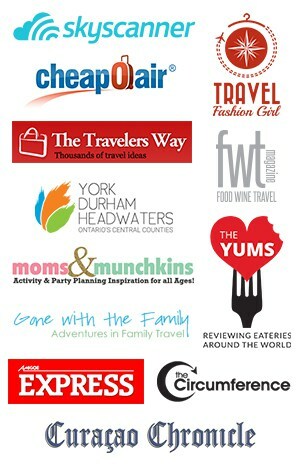 These are just a few of our favourite stops along the route that we found on our Big Bus Tour. If you are visiting with younger children, you may wish to add stops to the Philadelphia Zoo, Franklin Institute and Please Touch Museum to your itinerary. No matter where you hop on and hop off, the Big Bus Tour will not disappoint. 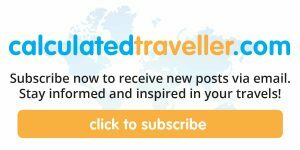 Have you been to Philadelphia? Did you try out the Big Bus Tour? What was your favourite attraction? Share in the comments below!